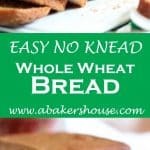 Easy No Knead Whole Wheat Bread is just the kind of no fuss recipe you need to make homemade bread. I wanted to make a new bread (for me) along the lines of my favorite technique of bread-making: the no knead bread. This is a somewhat magical way to not spend a ton of hands-on time working on the dough. Instead, the ingredients are beaten with a stand mixer for a short time then put into a bread pan where the dough rests and rises until it is ready to be baked. You’ll find all sorts of recipes for no-knead bread, some have an extended rising period overnight but this one is brief, only an hour and a half. 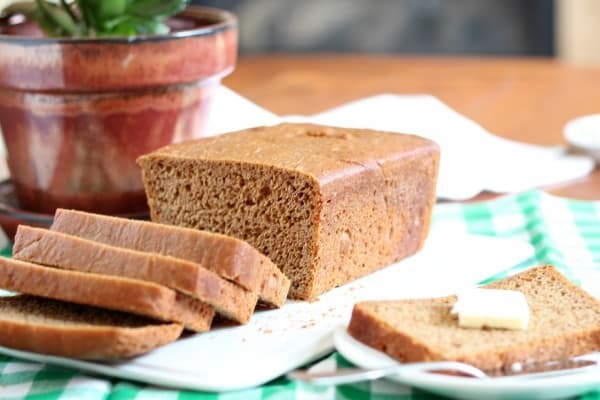 The result was a pleasant surprise loaf of no knead whole wheat bread– a simple, whole wheat loaf of bread perfect for sandwiches, ideal for toast and butter, and my left overs were made into breadcrumbs for future dishes. If you like baking yeast recipes, try hatch chile bread, whole wheat raisin bread, and knead not sourdough bread. I used this recipe from King Arthur Flour. I rely on their bread recipes and especially appreciated the tips provided this time: “If you use a 9″ x 5″ pan (measure the inside/top dimensions to see what size you have), your loaf will turn out shorter and flatter.” I only had a 9″ by 5″ loaf pan and, yes, my loaf did turn out flatter on top. This did not seem to adversely effect the flavor the bread. I’d like to try it next time with the 8″ x 4″ loaf pan to see the difference. Welcome to #BreadBakers! For this inaugural virtual baking get-together the theme is to make a FAVORITE bread. Yeast breads, quick breads and unleavened breads are all welcome. Just get baking! Loving the idea of NO KNEAD? Try this recipe for a Sourdough Knead Not Dough from an Alton Brown recipe. Prepare the loaf pan and spray with baking spray. I used a baking spray that contained oil and flour. Measure all the ingredients into the bowl of a stand mixer. Using the standard mixing paddle, beat the ingredients for about 3 minutes on medium-high speed. The dough will be wet and sticky. Spray a spatula or dough scraper with baking spray so that the dough won't stick and scrape/pour it into the prepared pan. Spray a sheet of plastic wrap with baking spray then use it to cover the loaf pan. Allow the dough to rise until it reaches the rim of the pan, about 60-90 minutes. Preheat the oven to 350 degrees F. Take the plastic wrap off the loaf pan and bake for 45 minutes. If the bread begins to brown quickly, cover it with foil about half way through the baking time. #BreadBakers is a group of bread loving bakers who get together once a month to bake bread with a common ingredient or theme. Follow our Pinterest board right here. Links are also updated each month on this home page. We take turns hosting each month and choosing the theme/ingredient. Thanks to Renee of Magnolia Days and Stacy of Food Lust People Love for creating this group. If you are a food blogger and would like to join us, just send Stacy an email with your blog URL to [email protected]. No need to knead? Sounds great to me, Holly! Yes, this is an easy recipe to create quality, homemade bread in less time than you might think. Love the orange and molasses in this bread. One brightens and the other comforts. I haven’t done a no knead yeast bread yet but will put it on my to-do list. Thank you so much for joining in Bread Bakers and sharing such a lovely bread too. You are exactly right, Renee, the orange and molasses set this whole wheat bread apart from other recipes I’ve seen. Thanks for leading the #BreadBakers group! I am intrigued by the orange juice/molasses combo! What a lovely bread! Yes, the orange juice was new to me too. I read on the King Arthur website that the orange helps balance some of the earthy, wheat flavor in the bread. It does brighten it a bit while the molasses deepens the flavor. Great combo. I love the King Arthur website, Holly! It does have some of the best tips and recipes. Your flavors sound cozy and inviting with the orange and molasses. I am imagining this lovely bread toasted with some warm peanut butter for breakfast. Yum! Thank you so much for joining us for the inaugural Bread Bakers post! Thanks, Stacy, to you and Renee for getting this group of bakers together. I look forward to many months of bread baking with you all! Gorgeous looking whole wheat bread, Holly. I have not been able to make a good looking whole wheat bread . I must try this recipe. For now I wish I could just drop by and eat it with you with some butter and coffee. Thanks, Ansh, I am determined to get through a bag of whole wheat flour that I bought recently and this was a good recipe for sure. So much nicer than store-bought bread. I’ve got a 5 pound bag of whole wheat flour in the cupboard just begging to be used right now. This looks like a great place to start. Love this recipe. I will keep my eye out for recipes you post using whole wheat flour. I did not get through my last two bags of wheat flour before they were swallowed up by my pantry…and this time I am determined to find a good use for this bag! I hate to let ingredients go to waste. Wow! I’ve needed a bread recipe just like this that I can throw together quickly and not worry about having to babysit it too much. I’ll definitely give this one a try! Great post! Yes, this is the type of bread to try when you don’t have a lot of time for kneading and multiple rising times. Hope you find time to give it a try! Funny this world…I know both Stacy and Renee and others in the group and always wish I made more bread. Good for you for tackling it so often. BTW…email to you was rejected by hotmail; I’ve got my host looking into it but it’s a grr moment. I’m going to dm it to you on Facebook about getting together. We need to do a group thing down here and hoping we could plan that! Join us, Barb! Even if you don’t have time to post a bread every month it would be so nice to bake along with you. Thanks for the facebook message. I would love to meet for coffee soon and let’s plan on a housewarming that isn’t quite a housewarming party too! I like the sound of this! No knead always makes things so simple and this looks so simply good! Perfect time of year to have the house filled with the smell of fresh baked bread! Yes, simple is always better for me. I would like to dive in deeper to yeast doughs and will do so when the time comes, but for now, this no-knead method is fabulous. Tasty too! I love how they use orange juice with the whole wheat. It takes away so much of the potentially butter flavor. Gorgeous!! 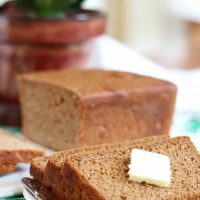 Yes, I learned by reading through the original recipe’s comments that the orange juice balances the bitter flavor that sometimes comes through in wheat breads. I hadn’t considered that at all. I really enjoy the learning process that each loaf of bread baked at home provides!